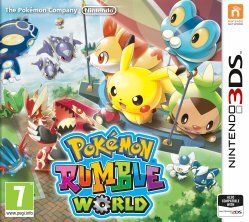 Pokémon Rumble World is the fourth game in the Pokémon Rumble spin-off series. This game is available on the Nintendo 3DS and is a free to play title where you can recover your Pokémon using PokéDiamonds which you can find in game, earn via StreetPass or purchase in the in-game store. In this game, you play as your Mii as he helps a king find various Pokémon toys to collect Pokémon to show off against a magician who lives nearby who has more than the king. When you StreetPass a player, you get a special mission where you have to protect their Mii from a wild Pokémon attack. When you do, they will appear in stages and give you a bonus: Attack Support, which boosts Attack, Defense Support which boosts Defense, Speed Support which boosts your Pokémon's Speed and Recovery Support which will heal you. You have the ability to purchase PokéDiamonds in the game to speed up your progress, but you can only buy up to 3000 Poké Diamonds. Once you have reached that limit, the game stops you making any further purchases and gives you the opportunity to purchase VIP cards with some Poké Diamonds which allow for cheaper balloon inflation.